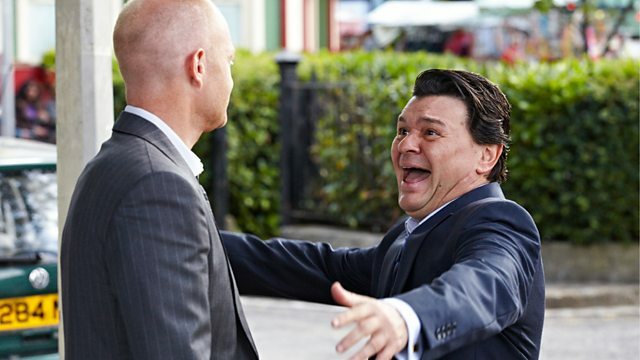 Phil receives news about Ben's sentencing, and makes an impulsive decision that panics Lola. Cora is terrified about what she will find when she and Jack track Rainie down. Jack gives Cora Rainie’s number and Cora arranges to meet her. Cora’s angry when Rainie’s sponsor, Olivia, arrives with a letter from Rainie. A drink’s spilt; ruining the bridesmaid’s dress Cora’s brought along. Olivia insists Rainie’s doing well but can’t be around Cora, who triggers her behaviour. She asks Cora not to contact Rainie again. Cora rips up the letter and bins the dress. Phil dashes Lola’s hopes of getting Lexi back after Sharon refuses to get involved. Jimmie informs Phil Ben’s murder charge has been dropped; he’ll be sentenced for manslaughter. Phil decides to tell Ben about Lexi; if he and Lola were getting married Ben’s judge might be lenient and Social Services impressed. Ben agrees to see Phil. Billy begs Phil not to take Lola and Lexi away from him. Lola makes Phil hold Lexi. Lola and Trish won’t let Phil take Lexi to visit Ben. Lola pleads with Phil not to tell Ben about Lexi, she just wants his help. Phil drives away. Lauren makes Whitney tell Lucy about her kiss with Joey. Lucy asks Alice about Joey’s previous girlfriends. Alice tells Lucy there was one girl Joey really liked, he used to tuck her hair behind her ear. Lucy confronts Joey about Whitney and breaks up with him. Joey reads up on used cars. Annoyed about Joey’s new job, Derek guilt trips Max into making him best man. Sure they won’t be welcome at the Masoods’, Syed tells Christian they’ll have their own Eid feast. Danny texts Syed. Abi finds Jay in the park, dazed; his solicitor’s rung about Ben, Jay won’t have to testify. Jay tries to talk to Phil but Phil’s got nothing to say to him. Abi’s about to head to school when Jay appears with flowers, insisting all he wants is to go bowling with her.